These guys will probably return in the future, because I had way too much fun drawing them. 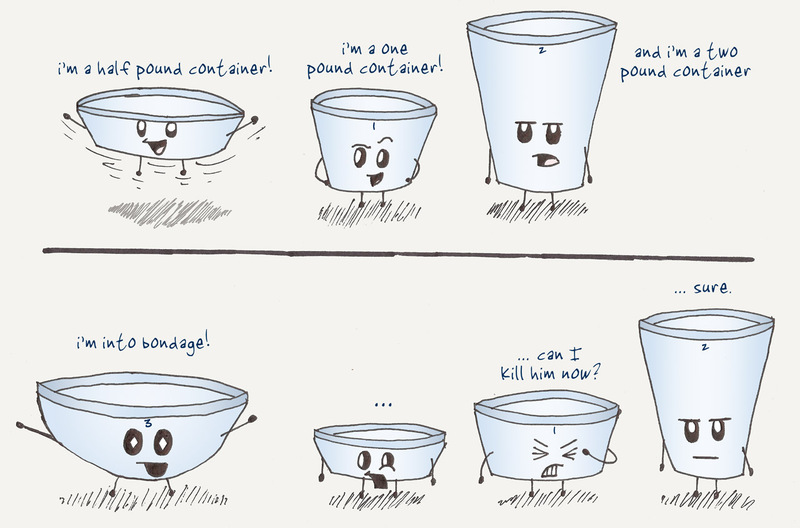 They're easy, they're cute, and they're based on the containers we use at work, so my coworkers find them extra funny. Their names are (in order of appearance): Halfsie, Whole, Two, and Three. All have the last name Pound. Three is the bowl-shaped perv, Halfsie is the cute excitable one. A lot of people were getting Three confused with Halfsie. Originally this was an innocent idea- "I should draw a thingy telling people what the container sizes actually are, because people usually guess wrong!" Naturally, my sense of humor stepped in and made the 3 pound container into a perv. Yay for my sense of humor! The numbers on their foreheads were added in Photoshop in order to make them easier to distinguish. Made with pen, paper, and photoshop.